New Mexico is one of the top destinations for RVers looking to escape the harsh winters up north. With sprawling high desert landscapes, canyons, and fantastic vista views, New Mexico offers warm weather and pleasant RV parks. I’ve put together my top five RV parks, sites and grounds so you know where to stay when you’re out exploring the Land of Enchantment. Try Hacienda RV Resort for an excellent place to stay in southern New Mexico. Every RV site has a privacy barrier so you can enjoy your full utility hookups, free cable TV and Wi-Fi access in your own serene area. The 24-hour clubhouse extends this privacy with secluded showers (with hair dryers.) Hacienda also contains clean laundry facilities. The facilities don’t end there, with an events room, spacious outdoor patio, hot tub, dog park and more. Southern New Mexico has plenty to offer the outdoor and cultural enthusiast. You can explore the culture and fun of Mesilla, New Mexico or explore many of the local parks such as the Chihuahuan Desert Nature Park, Mesilla Valley Bosque State Park, Leasburg Dam State Park, Fort Selden State Monument or Achenbach Canyon just to name a few. With so much to do and the nice amenities, you could find yourself staying at Hacienda for some time to come. This UNESCO World Heritage Site is chock full of history and some great sites to visit. I typically don’t do parks that only allow for dry camping but Chaco is well worth it. You’re left without any amenities, many of the RV grounds are outfitted with dump stations, restrooms, utility water pumps and potable water can be found in the visitor center. Chaco does allow the use of generators between 8 AM and 8 PM. Chaco truly is a unique offering, containing many unique sights and sites. Chaco was a major cultural center for the Pueblo people for hundreds of years and many structures or ruins are available to tour. The most famous of these landmarks is the Great Kiva of Chetro Ketl in the park. Since you are out in the wilderness there are ample opportunities to view native flowers and wildlife including, coyotes, pronghorns, bobcats, birds of prey and more. 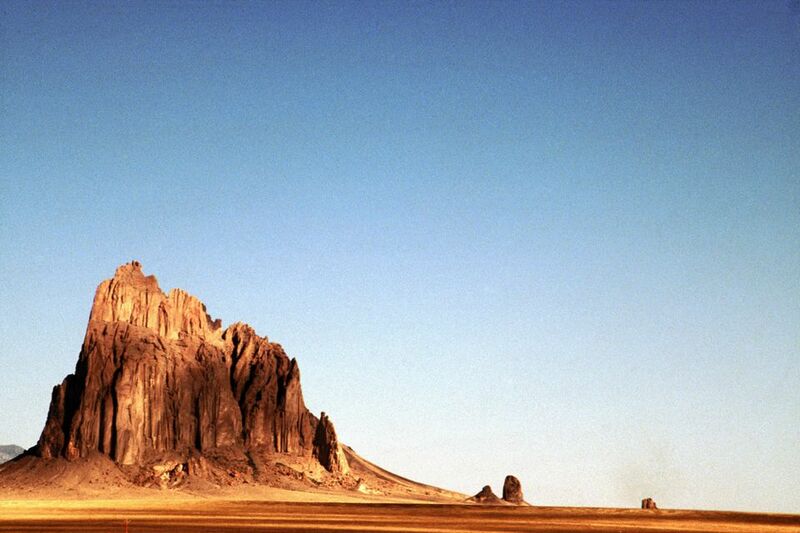 The area also has natural formations like the Fajada Butte. Take a trip on the Trail of the Ancients Scenic Byway to capture all this portion of New Mexico has to offer. American RV Park is a great place to stay for both their facilities and the history of the Albuquerque area. American’s facilities are highly rated. You have your choice of back in or pull through sites, all outfitted with full utility hookups in beautifully landscaped lots. There’s just one word to describe the showers and laundry facilities, immaculate. There’s a large clubhouse available for rent, dog park for the pooch, a camp store with propane refills and groceries and best of all, a free continental breakfast. From American RV Park you can explore the unique offerings of Albuquerque. For the Native America history buffs, there’s Acoma Sky City Pueblo, the Indian Pueblo Cultural Center, and the Coronado State monument. For outdoor offerings, there’s the Sandia Peak Aerial Tramway for fabulous desert views, the Petroglyph National Monument and plenty more. Make a point to take a long drive, or bike, down the Turquoise Trail National Scenic Byway. Transport yourself directly to the serene beauty of New Mexico by staying at Oliver Lee Memorial State Park. Updated facilities and amenities await you as Oliver Lee provides electrical and water hookups while providing dump stations for your dirty business. The park also houses showers, restrooms and even laundry facilities, great amenities for a State Park. The park also provides group pavilions and shelters if you’re traveling with a group. There are numerous attractions around the Alamogordo area and Oliver Lee but the prime spot to see is the White Sands National Monument, the stark white sands, dunes and native life are truly a sight to behold. Of course, there are some great trails around Oliver Lee that you can explore as well. Other nearby areas include Lincoln National Forest and the San Andres National Wildlife Refuge. Stay at the Carlsbad KOA for great KOA amenities and great proximity to Carlsbad Caverns National Park. It’s a KOA so you know you’ll get great amenities, this park can accommodate rigs up to 75 feet with full utility hookups at every site as well as Wi-Fi access and cable TV. The bathhouses and laundry facilities are clean which you might need because there’s BBQ available every night. Carlsbad KOA rounds out their amenities with a snack bar, bike rentals, a horse hotel and more. When staying at the Carlsbad KOA you will be just down the road from the unique offerings of Carlsbad Cavern National Park, take a guided tour or go on hikes around this unique formation. You are also in very close proximity to Living Desert Zoo and Gardens State Park as well as the Sitting Bull Falls Recreation Area. New Mexico is a state that you can RV in year-round, so take advantage of these five RV parks and stay awhile. Does New Mexico Have Earthquakes?